'Who Am I?' 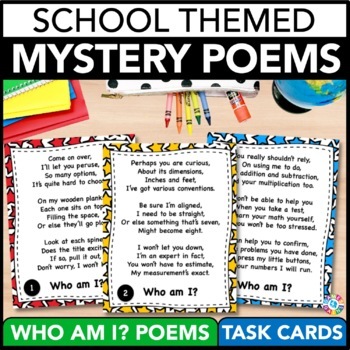 School Poetry Task Cards provide a fun way for your class to practice poetry. 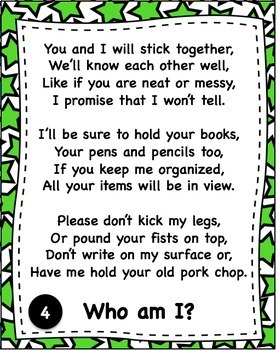 Each original poem describes a well-known school supply, without explicitly saying what it is. Students have to work together to guess which school supply is being described. 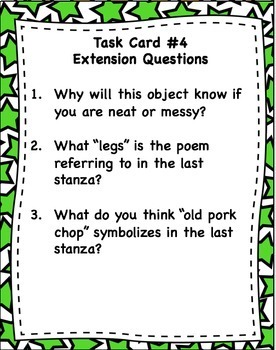 After students have guessed each item, they can complete the extension questions task cards, which contain 3-4 comprehension questions for each poem. Those extension questions can even be saved until later in the year when you are studying poetry! Want to learn more about what you'll get? Check out the preview file to see a sample of the actual pages. 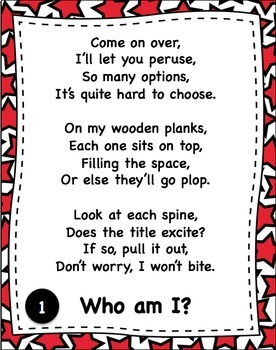 The poems included with this game are original poems. Due to copyright concerns, poems by popular poets could not be included or referenced. I hope that you and your students enjoy them! Think ahead and SAVE $$ by buying this activity as part of a bundle.